They used to call it El Camino Ingles because it was built and used by the British, who would set out from the sweltering summer heat of Gibraltar heading for some respite in the cooler climate of the Serrania de Ronda, the mountain range that encroaches upon Andalucia’s most famous puebloblanco of the same name. These days it’s a question of taking the A377 from the coast, up past the stunning little town of Casares that teeters on its outcrop,and joining the A369 at Gaucin, all the way to Ronda. If that sounds less romantic than the original, the drive up there certainly isn’t. The road from Gaucin onwards offers commanding views of the Guadiario valley on the left and, in particular, a string of pueblosblancos along the Genal valley to the right. 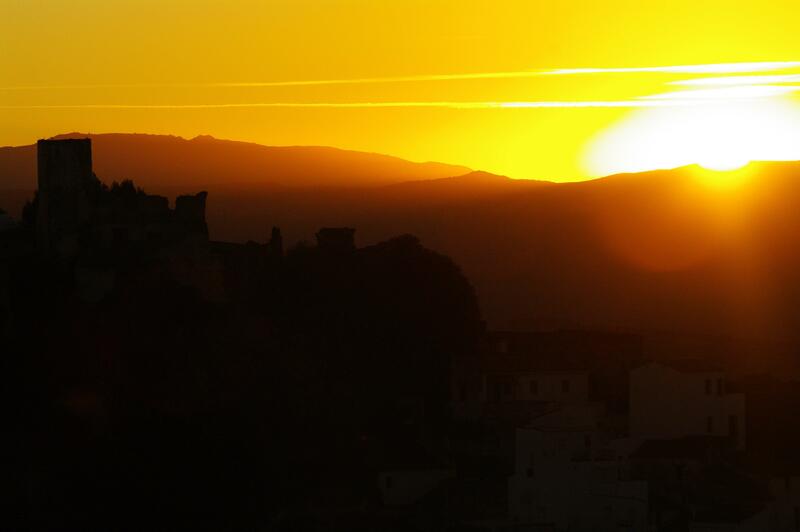 Even amongst the stiff competition of the region’s many mountain towns, Casares delivers some serious eye candy. Very close to the Costa del Sol, it has completely escaped the mass tourism that characterises its famous neighbour. 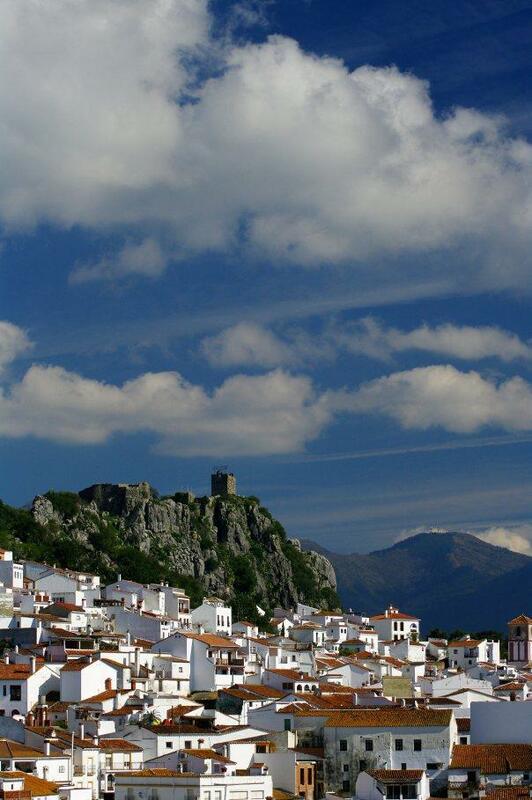 All pueblos blancos seem to drape themselves over unlikely heights, but few if any of them do it as dramatically as Casares ,which is probably why the cover shot for the Lonely Planet guide to Andalucia was taken here. There are numerous hikes in the area and some spectacular karst(limestone) landscapes nearby as well as a number of modest little bars and restaurants in the town itself. Your tired feet will be glad of that because there isn’t a square metre of level ground in the place. Gaucín is not that much further from the coast and the drive there from Casares will delight your eyes and lift your spirits even as it tests your suspension. It’s a truly spectacular pueblo with an old castle on a bare rock outcrop that overlooks the sprawl of the whitewashed town below. These days it has attracted a community of artists and expats, though in most ways it’s still just a typical country town. It’s the gateway to the Serrania de Ronda and its shops are well stocked with the wines, cheeses and artisan food products of the region. Once past Gaucín, the road improves and, moreover, is liberally sprinkled with miradors at which you can stop and gaze over the forested Genal valley. For the more actively inclined, the Gaucin via ferrata route is not to be missed. Benarrabá is more or less hidden from the road, four or five kilometres north of Gaucín, so few if any people end up here by accident. That’s probably a good thing as the town remains, in many respects, a well-kept secret and a night or two in the one hotel makes for a very peaceful rural getaway. It has not developed and grown as the towns around it have and in 2008 reported a population of just over 600. All that changes once a year around February when Benarrabá,which like so many puebos blancos has had to reinvent itself to get by in the modern age, holds its annual food fair – the Feria Gastronómica de la Serraníade Ronda, which brings together local producers of wine, cheese and meat products (not to mention ice cream and chocolate) in the town’s main square.Usually coinciding, the local bars (there are quite a few for a town so small! )put on a ruta de tapas, offering signature tapas that rely heavily on locally sourced foods. 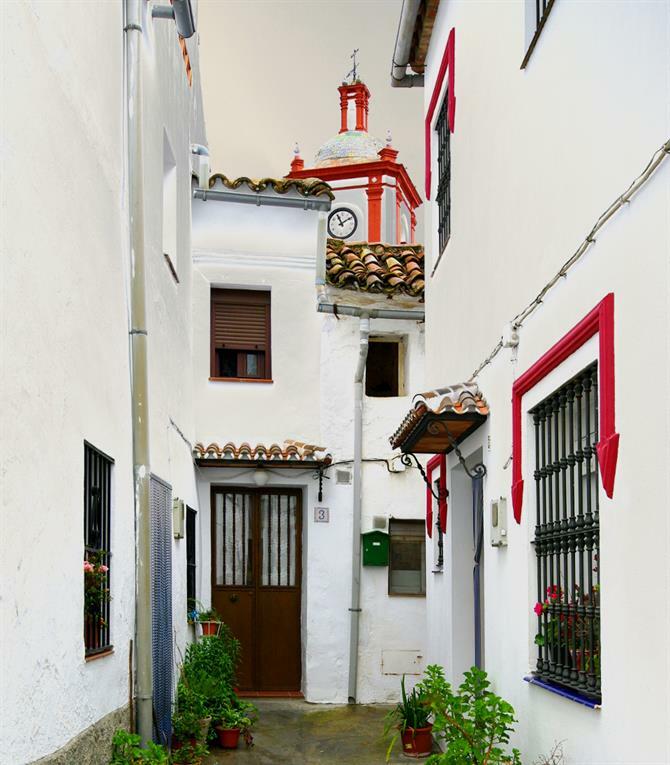 Leaving Benarrabá and travelling just another few kilometres, we reach Algotocín, the first of a string of pueblos blancos that adorn this road like white beads on a string. It’s well worth a visit in its own right but we’ll take a detour here, following the little road that takes us across the valley to the unusual little town of Genalguacil.Strolling around the few streets of this particularly remote white village, it becomes clear that reinvention has been taken seriously here. Art and sculpture is on display everywhere in permanent and semi-permanent states. Some bright spark had the idea, a couple of decades ago now, of inviting a group of artists to hold workshops and it has become a tradition in the form of a biennial art festival (the next one is in August 2014). Prize winning works go on long term display and the most surprising sights await you around just about every corner. Back across the valley the Camino Ingles takes us through a series of towns whose names betray their Berber origins – Benalauría,Benaladid, Atajate – and through the arresting landscape of the Serrania till the road finally dips and descends toward our final destination: Ronda. There is nowhere quite like this Andalucian pueblo. The home of modern bullfighting and one of Spain’s most beautiful bullrings, it sits astride El Tajo, the jaw-dropping gorge that the Rio Guadalevín has carved out. Absolutely steeped in history, Ronda boasts some well-preserved hammam baths as well as a Roman bridge but the real eye-catcher here is the “new” bridge, a mere two hundred and twenty years old. Views of and from the bridge, looking down into the hundred metre gorge, are unforgettable, particularly in the evenings when the coach parties have left. Do yourself a favour and make an overnight of it. Although there are a large number of mediocre restaurants to be avoided, there are some real gems too, like Almocabar or Carmen la de Ronda. 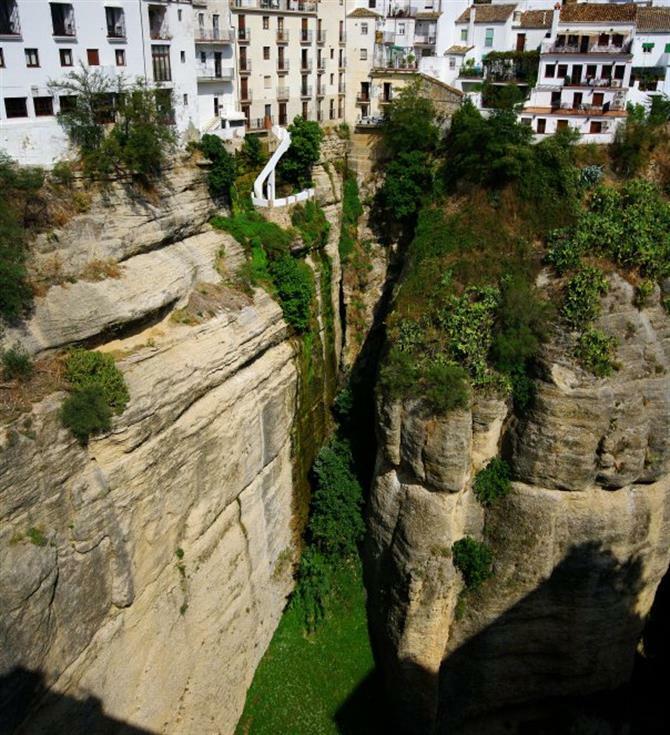 For some fantastic holiday rentals in Ronda and additional articles about Ronda.